Natural pozzolans are abundant in NZ and have been used in concretes for the construction of damns and other infrastructure projects as early as 1950. There are various types of natural pozzolans deposits found in NZ including pumicites, diatomaceous earths and amorphous silicas. 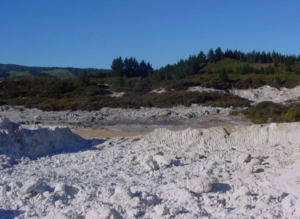 From a mineralogy perspective the amorphous silica deposit at Titkitere near Rotorua (Central North Island) is extremely pure. This natural amorphous silica resource is hosted in hydrothermally altered rhyolitic rocks, mainly Mamaku Ignimbrites and Rotoiti Breccia. Both have been extensively altered with widespread silicification (especially the Rotoiti Breccia) within the Tikitere Hydrothermal Field. At the Titikere, a reactive pozzolanic concrete additive, “Microsilica 600” (MS600), is being produced. MS600 has a high level of purity – 93% SiO2 of which the crystalline content is approximately 6% to 8%. The raw material is ground to 5 times finer then cement. In house production requirements target 55% of the finished product smaller than 2 microns. Graeme Hastie drove the development of this important natural resource. In New Zealand, M600 has been established as a premium product to enhance concrete properties. It is a key ingredient in high performance concrete. M600 has similar properties to silica fume. This applies to concrete properties, such as chloride diffusion, resistivity, sorptivity, strength and chemical resistance. Graeme was instrumental in having the Australian Silica Fume Standard (AS 3582.3) changed to incorporate amorphous silica. MS600 is available in bulk, degradable paper bags and slurries.